For years, Nmap  has been essential to system administrators. There are virtually no alternatives to the classic tool for penetration testing. Out of the box, this tool already gives you more than 100 standard scripts. However, Nmap offers more than just the ability to run predefined scripts. The Nmap Scripting Engine (NSE) gives you what is potentially the most powerful and flexible feature of all: the ability to run your own scripts and thus automate various scanning and analysis tasks. The scripts are based on the Lua programming language , which is easy to learn and perfect for developing test scripts. Nmap executes these scripts in parallel at a high speed and with great efficiency. Nmap's core functions are network, version, and vulnerability analysis. 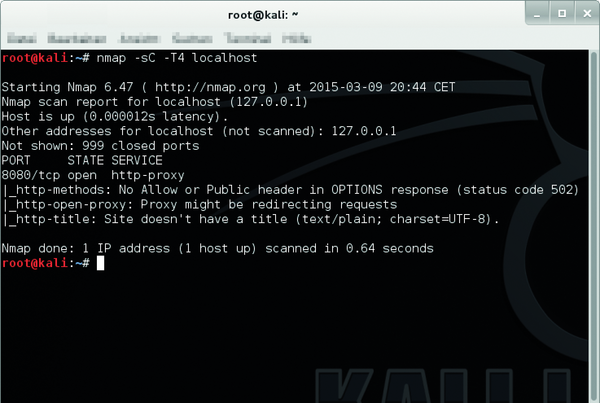 NSE takes scanning with Nmap to the next level. For example, you can use the scan engine to identify SQL injection vulnerabilities and potential brute force attack vectors. With the help of NSE, you can create your own test scripts and modify existing ones. To help you keep track, the developers have divided the scripts into various categories. You need to be familiar with these to be able to assign your scripts correctly via the header configuration. Based on the category name, you can see the field of application. Table 1 summarizes the various types. auth These scripts handle authentication data and attempt to work around the authentication on the target system. Examples include x11-access, ftp-anon, and oracle-enum-users. The exceptions are scripts for brute force attacks. broadcast Scripts in this category output broadcasts to identify any previously unidentified hosts on the local network. The newtargets argument automatically adds any newly discovered hosts to the scanning queue. brute Scripts of this type execute brute force attacks to retrieve the target system's access credentials. Nmap has dozens of such scripts for various protocols, for example, http-brute, oracle-brute, and snmp-brute. default These are standard scripts that are used if you run Nmap with the -sC or -A options. discovery These scripts actively attempt to discover more about the network by, for example, querying public registers, SNMP-capable devices, directory services, etc. Examples include html-title, which captures the title of a website, or smb-enum-shares, which reads Windows shares. dos Scripts from this category can cause denial of service attacks. The reason for this is typically testing for vulnerabilities. The service crashing is more of an undesirable side effect than the objective. exploit These scripts target vulnerabilities. external The scripts in this group send data to external databases and network services. For example, Nmap can query a whois server for more details about the target system. fuzzer These scripts send unexpected or random fields in each packet transmitted to the target system. This technique can be used to identify unexpected or unknown vulnerabilities of the targets. An example of this is dns-fuzz, which confronts a DNS server with unknown requests until the server either crashes or blocks the connection. intrusive These scripts cannot be assigned to the safe category because the risk of the target system crashing is fairly high. The reasons include the use of considerable resources or exploiting existing vulnerabilities. If you cannot assign your own scripts to a specific category, you should at least classify them as safe or intrusive . malware These scripts are used to discover whether the target system is already infected with malware or backdoors. Examples include smtp-strangeport, which checks SMTP servers for intruders, and auth-spoof, which identifies identd spoofing daemons. safe These scripts are considered to be safe and will not cause damage to the targets. However, they can use considerable network bandwidth or other resources. Examples include ssh-hostkey, which queries the SSH key, and html-title, which parses the title of a website. version These script types are extensions of the version detection types, however, they cannot be selected explicitly. They only run if you enable version detection with the -sV option. Examples include skypev2-version, pptp-version, and iax2-version. vuln The last script type tests for specific known vulnerabilities. However, reports are only output if vulnerabilities are actually found. Nmap's core functionality is and will always be scanning network components. The version identification system can distinguish between thousands of different services. To do this, the scanner relies on tests and a match system that also supports the use of regular expressions. Nmap reliably identifies SNMP services and discovers brute force vulnerabilities. Both options can be easily exploited with NSE and matching test scripts. For administrators, identifying existing and new vulnerabilities in the IT infrastructure is an essential task. It is a matter of getting there before others do. Although Nmap is not a security scanner like Nessus or OpenVAS, thanks to the scripting engine, you can perform simple vulnerability tests. Currently, Nmap has several scripts for this, and the developers are planning to add more. Nmap and NSE are also useful for detecting backdoors. Hackers and worms typically leave a backdoor after an attack to ensure easy access to the system on next contact. Nmap scripts can identify these – not all, but a large number. NSE can also be used to identify complex worms and backdoors. With NSE as a general scripting environment, you can of course also exploit any vulnerabilities you identify. The ability to run exploit scripts is particularly useful for pen testing. However, the developers are not planning to convert Nmap into a full-fledged exploitation framework like Metasploit. That said, it is good to know that you could also use Nmap in combination with NSE for this job. To get started developing your own Nmap scripts, you first need to enable the engine. If you have Nmap in place, this is easily done: Just use the -sC option. The results of the script execution are integrated into Nmap. Prerule scripts are executed before the scan. They can be used, for example, to collect service information. Some of these script types also define new targets, which are then analyzed by follow-up scripts. Service scripts contain the portrule function, which attempts to find out which services are running on the target host and with which ports. Nmap has more than 15 scripts for testing HTTP services on web servers. If a web server with various ports is running on a target, the script runs multiple times – once per port. The fourth script type is the host script. This type is typically used after Nmap has run discovery, port, version, or operating system scans. The hostrule function is applied here. An example is whois, which identifies the owner of a target system, or path-mtu, which discovers the maximum IP packet size accepted by a host. Phase one is pre-scanning. It only runs if you use the -sC or --script options. This is an attempt to use NSE scripts to discover more information about the target (Figure 1). Figure 1: Initial Nmap run with the Nmap Scripting Engine enabled, targeting localhost. In phase two, Nmap resolves the target's hostnames, to be able to continue working with the IP addresses. In phase three, Nmap then discovers whether the target(s) are accessible. It uses various discovery techniques to do this. You can omit this phase using the -Pn option. Phase four involves reverse DNS resolution. Nmap performs a reverse lookup here to discover the hostnames of the targets. You can enforce this phase with the -R option and skip it with -n.
Phase five is port scanning – the classic task. In this phase, Nmap discovers the status of the ports to analyze. You can also omit this phase by stipulating the -sn option. Phase six is advanced version detection for the open ports found. This phase is only performed if you stipulate the -sV argument when running Nmap. In phase seven, Nmap attempts to identify the operating system run on the target hosts. This test only occurs if you use the -O option. Nmap scans can cycle through three more phases, with phase eight being the traceroute phase in which the port scanner determines the route to the hosts. This phase is enabled by the --traceroute option. NSE scripts are finally used in phase nine. The output is generated here on the basis of the output configuration defined in the script. Nmap formats the acquired information and outputs it. The tenth or final phase is known as post-scanning. Here the post-scans defined in the NSE script are executed. If no more tests are defined, this phase is omitted.